Another great turnout and for the fifth year running we have hit 50, one away from the record attendance. It was great to get the opportunity to include the whole Club, even if providing times to some of the newer members was challenging. I hope all enjoyed the Handicap experience, as it’s pretty different to running a normal race! A big thanks must go to Stuart Hale for providing a comprehensive list of everyone’s race times; giving me plenty of data to work with in calculating the handicap times. 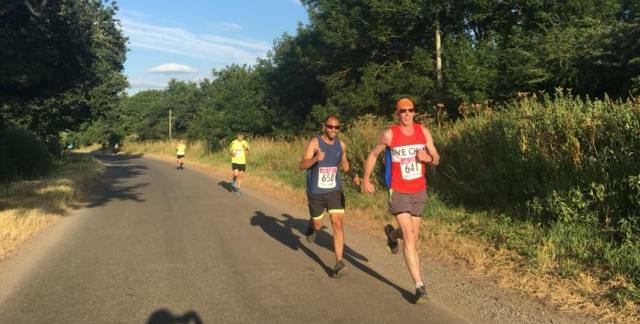 A great evening with the weather for the barbecue but the warmth made it challenging for the runners with fewer than normal getting inside their Handicap times. Albeit some good times were achieved on what is a fairly difficult course. The quickest male on the evening was newcomer Tom Corby, who takes the Championship Title for the first time, completing the course in fairly quick 35.51. A superb run by Kieran Flannery saw him take 2nd in the Championship with a time of 37.25, over a minute quicker than last year and as a result switched places with Stephen Snow from 2017. Stephen still improved on last years time by 27 secs. In the Ladies race Nicki Nealon took her 15th Championship Title in a time of 39.19, being beaten by just three men. 2nd place for the Ladies appeared very competitive, with Tina Tosh, having one of her best performances taking it in a time of 44.50 (which appears to be a PB for 10 km?! ), ahead of Helen Mercer (45.22) and Clare Surrell (45.48). 1st across the line was Oliver Fishwick, in a very respectable 52.20, just over three and a half minutes quicker than I had predicted! During the busiest period we had 32 finishers in 2 min 11secs! Well over half the field! This years event saw the largest ever number of Lady competitors in the Club Championship Handicap event. Nearest handicap ended as a joint affair with Ian Thompson and Nicki Nealon being 4 secs adrift to take that prestigious Title; Ian being just inside and Nicki just outside her predicted time. Thanks to all the helpers; I have to give special thanks to Marie Wilford for the food organisation, including ordering and collecting the chips, along with organising a video for confirmation of placings. Thanks to those individuals who came and offered to marshal and help keep the runners on the right course. Also specific thanks to John, Phil and Tony for helping time keeping and recording; it’s always challenging getting everyone away on time and Tony did a superb job.